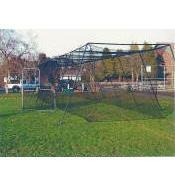 Get in the perfect practice anywhere you want with our portable batting cage. The snap-lock frame makes assembly and disassembly easy without the need for any tools. The frame is built tough with powder-coated steel and the HDPE netting is treated to be both UV and water-resistant. This makes our professional-quality equipment ideal for indoor or outdoor use. Included with the frame and net is a 10’ X 10’ impact panel ideal for baseball or softball. Reaching your potential takes a lot of practice and our portable batting cage can be there for every swing.